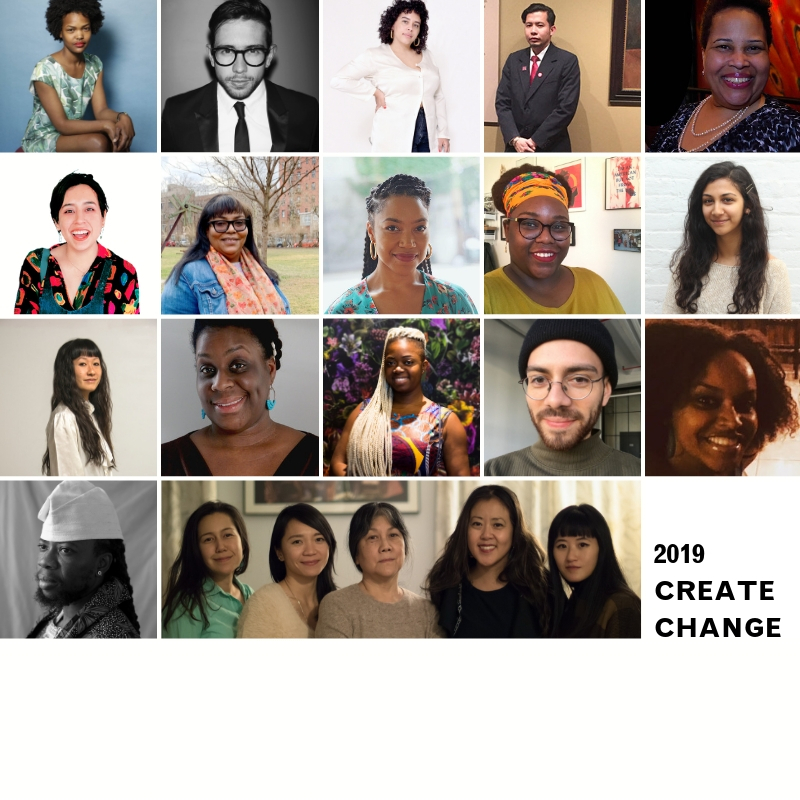 We are excited to announce the participants in our 2019 Create Change program, designed to engage, educate, and advance artists. These diverse, creative practitioners are change agents embedded within our New York City neighborhoods. Building on learnings drawn from our two-year exploration of the theme of sanctuary, this year the cohort will investigate the theme of abundance as a pathway to imagine more for ourselves and our communities. Our creative visions, ideas, and actions can fuel new ways of making positive change in the world. Through abundance, we know that we are many, we are more than enough, and that our communities encompass everything we need to work towards an equitable future. Over the course of six months to one year, five Artists-in-Residence will develop creative projects as sites for community engagement. Each resident artist/collective will make use of the unique location (e.g., a public plaza, a community garden, a library, etc.) and work with their neighbors to address shared concerns. In addition, through The LP’s specialized and celebrated six-month training series, 12 Fellows will develop, deepen, and put into practice, strategies for making community-engaged art. This year’s Fellowship will center its activities within one anchor neighborhood – the Hunts Point / Longwood area of the South Bronx. Through the theme of abundance, Fellows will work on proposals for local cultural resources that center the voices and histories of long term residents, small business owners, youth, activists, cultural institutions, and artists throughout the neighborhood. The Create Change program is made possible in part through the generosity of The Andrew Mellon Foundation, Berk Foundation, The Jerome Foundation, New York City Department of Cultural Affairs in partnership with the City Council, and New York State Council on the Arts.